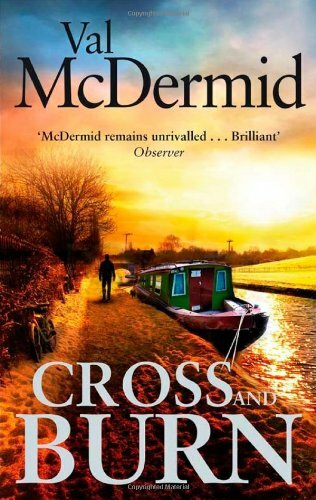 Cross and Burn, now out in paperback as well as hardback and ebook, is Val McDermid’s twenty-seventh brilliant thriller, and the eighth in her famed Tony Hill series, filmed for the TV series The Wire in the Blood. The seventh novel in the series, The Retribution, took both the careers and the troubled relationship between the clinical psychologist Tony Hill and DCI Carol Jordan to a crucial point. So where now? Cross and Burn takes two sharp turns that lead to a breathtakingly new approach to these issues – and to a first class thriller (though that’s to be expected from Val McDermid). Carol Jordan is no longer a DCI and Tony Hill therefore no longer working with her. But when a serial killer seems to be targeting women who bear a striking resemblance to Carol, Tony is drawn into a complex case that strikes terrifyingly and gruesomely near home. The last of your novels to be published before Cross and Burn was a stand-alone, The Vanishing Point, which you once said in an interview sprang from a real life panic of your own when you wondered what you would do if your son were abducted at an airport. Did Cross and Burn spring from a similar idea or did it emerge from the way the Tony Hill-Carol Jordan situation had been left in The Retribution? The roots of Cross and Burn lie firmly in The Retribution. That book drove a wedge between Tony and Carol and if I’m honest, I wasn’t sure if they could recover from that. Eventually I realised that the only way I could draw them back into each other’s orbit was to focus on the core principles that drive them – justice, in Carol’s case; compassion, in Tony’s. You began your writing career with drama and only later turned to novels. When you began to write in novel form did the drama experience help build the tremendous pace and drive that is a hallmark of your thrillers? I don’t think so. I fell into writing for the theatre by accident and I never really had the sense that I knew what I was doing! I suspect that what drives my narrative pace is the fact that I get bored very easily. I have to keep myself interested, so I have to keep pushing the story on relentlessly. You were a student at St Hilda’s College, Oxford, at the young age of seventeen, and are now an honorary fellow of the college. Was it there that you realised you wanted to be a writer yourself, or were you set on this path before you studied there? As soon as I realised that being a writer was a job, that the books in the library didn’t just appear by magic and that people got paid money for writing them, I knew that was what I wanted to do. But I came from a very traditionally working class background. The message I got from my family was that I was as good as anybody else and I could achieve whatever I set out to do. But the conflicting message I got was that people like us didn’t become writers. It was going to St Hilda’s that gave me the confidence to think I really could realise my dream. The Times wrote of your work that it is so ‘psychologically complex and so gripping that it puts your life on hold’. Is your own life put on hold while you’re writing or can you divorce yourself from the writing process at will? I’m quite good at switching off at the end of the working day if there’s something sufficiently interesting to grab my attention. A good TV box set, a pub quiz, a complex board game, a bloody good read, interesting company. But if there’s nothing powerful enough to distract me, my thoughts will wander off and play with my characters. The last thing I think about before I go to sleep is generally what I’m working on, just to make sure my subconscious has something to work on while I’m sleeping. You’ve been termed the queen of the psychological thriller and this aspect goes hand in hand with the graphic and gripping use of physical violence in your thrillers. Did you always see the two sides gelling when you began the series, or were you first drawn by the psychological side? To be honest, I never thought about it in those terms at all. When I’m writing, all I’m ever thinking about is the story I have to tell and the best way of telling it. I’ll use whatever I think is necessary to make the story work as a narrative. Sometimes that’s fear and suspense and withholding information; sometimes it’s about getting in my reader’s face with the difficult stuff. But it’s always the dictates of the story-telling that are at the front of my mind. Do you know where the overall story of Tony Hill and Carol Jordan is heading through the series or do you work out its development as you begin each new novel? I have no overall story arc for the books. The Mermaids Singing was supposed to be a standalone, not the start of a series but I was intrigued by the possibilities of the characters and their situation. I never know anything beyond the book I’m working on till I’m close to the end, then I start to have an inkling of where I might take them next. I don’t know how many Tony & Carol books there will be but as long as I find them interesting and I have fresh story ideas for them, I’ll carry on. You’ve written other series of crime novels, one starring Kate Brannigan series and one featuring Lindsay Gordon, together with seven standalone novels. You also write short stories, non-fiction and for children, and obviously from your writing have a great interest in history. Does this diversification help when you come to write, for instance, the next Tony Hill novel? And is there a particular field that excites you, perhaps one that you haven’t tackled yet? Are there advantages in writing a standalone crime novel as opposed to a series, and vice versa? There’s a delight in having a blank canvas so the story can run the game in the early stages of the imaginative process. But equally there’s a delight in picking up the reins of characters I know and love and finding a way to tailor the story idea to their capabilities. Both have their joys and their problems! 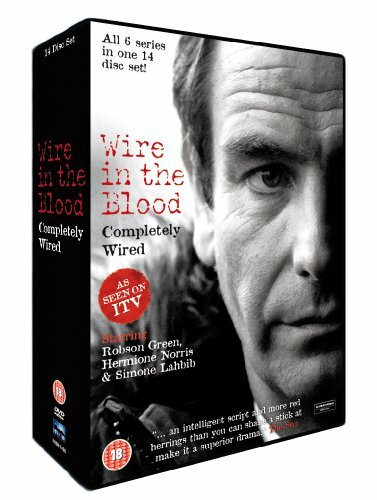 Was your mental image of Tony Hill affected by the TV Tony Hill in Wire in the Blood or did the two dovetail? Robson Green looks very like my mental image of Tony Hill so now when I think of Tony, I see Robson. But he’s the only character that’s happened with. How important is location to you while writing your novels? It’s a key part of the novel. Some books have been directly inspired by place– all the Kate Brannigans have Manchester as an integral part of the story; A Place of Execution is my extended love story to the Derbyshire Peak District; The Distant Echo and A Darker Domain owe their existence to my childhood in Fife. I need to have a very clear image in my head when I’m writing. And recreating that image gives the reader a real sense of rootedness within the narrative. Your writing is clear and graphic, which results in your characters and their varying plights living for the reader all too realistically, with no disbelief possible. The way you follow the step by step thought processes of your characters is gripping and often chilling. Are you sharing their inner emotions or thoughts with them as you write, or do you manage to maintain a distance from them? I have to keep a sense of objectivity and detachment or the book would be a mess of uncontrolled emotion spilling all over the page. Which is not to say I don’t also imagine very powerfully the emotional and psychological state they find themselves in. But there is a natural sense of distance that comes about because of the technique of writing. I’m always interrogating what I’ve just written – is that the right word, should this sentence end here, what would he/she say to that? Did you always have a love of thrillers as opposed to Golden Age detective novels? And if so did a particular writer set you on your path? I never categorised what I was reading. I still struggle with that. A good read is a good read. All sorts of writers affected what and how I write – Robert Louis Stevenson, Agatha Christie, Sara Paretsky, Ruth Rendell, Josephine Tey, Margaret Atwood... it’s a long list. But the very first one who influenced me was probably Elinor M Brent-Dyer who wrote the Chalet School books, from whom I learned so much, including the joy of series fiction. Do you deliberately plan your writing schedule so that there is a gap between one novel in a particular series and the next? What are you currently working on? I alternate at present between Tony & Carol and standalones. And other projects crowd close. Right now I’m finishing a non-fiction book about forensics which will accompany an exhibition later this year. I’m doing the final rewrites for a drama series for BBC Radio 4 and I’m researching geopolitics and the Balkan wars and feeling my way into the new standalone. Enough, already! Thank you very much for answering these questions – and thank you very much for writing Cross and Burn. Cross and Burn published 27th February 2014, paperback Sphere. Buy it here. Retribution is available in paperback and Kindle. Buy it here.